“This is a sad day for all motorcycle lovers in general and for motocross lovers in particular. On Sunday, August 25, 2013, an icon left us. The very first first official World Motocross Champion Bill Nilsson went to what some of us refer to as 'a better place!' Rest in peace Bill. 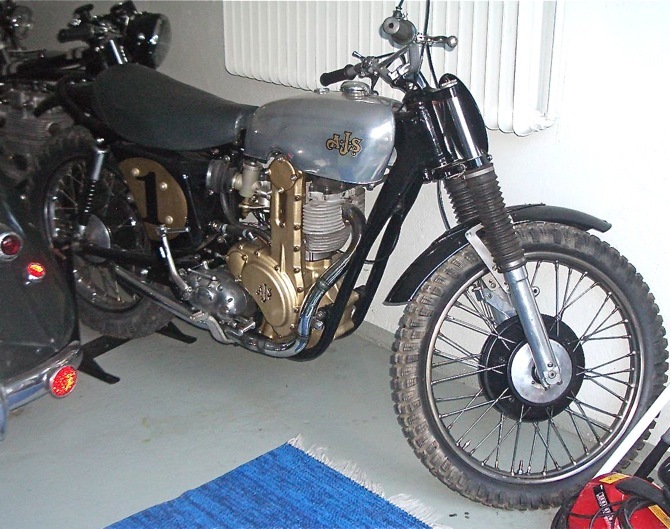 Bill Nilsson's 1957 AJS 7R. A few years ago Jeff Smith (left), Bill Nilsson (center) and Sten Lundin had a reunion with Lundin's Monark. 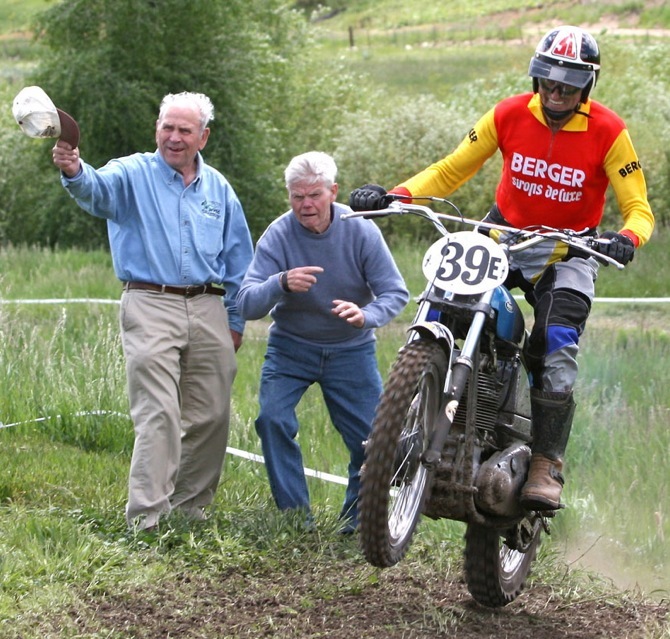 To learn more about the bikes and men that raced with Bill Nilsson click here. The news that former World 500cc Champion Bill Nilsson passed away on the weekend was a sad day for the sport. Nilsson was one of the real characters and a rider I was lucky enough to interviews back in 2008, when invited by Husqvarna to Sweden for a special introduction to their museum and also to meet some of the Husqvarna legends. It was probably one of the best weekends in my working life. Meeting riders like Nilsson, Torsten Hallman, Heikki Mikkola, and so many more, a true pleasure. The introduction image of Nilsson racing in Belgium was given to me by a Belgian photographer and its one of my favorite old school images. What I noticed about Nilsson was he was really a lively guy, happy in life and still tough as nails. Here is that interview I did with Bill Nilsson. I hope you enjoy it as much as I enjoyed doing it. 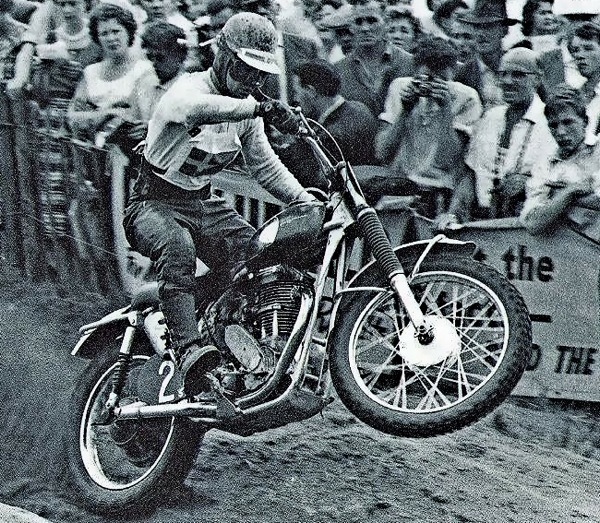 Two-time World Motocross champion Bill Nilsson was a rider who took no prisoners in a career which saw him win the first official World Motocross championship back in 1957. Despite standing at around 5ft 7in tall the Swedish legend brushed aside the might of the British BSA riders in an era which saw the European Motocross scene rise from the farmer type events to true World championship calibre. We were travelling to Sweden back in 2008 and caught up with the then 76-year-old former World champ (he would have been 81 in December). Nilsson didn’t hold back on the track, and still talked of his like for putting fear into his rivals. For Nilsson the sport he loved gave him not only success, but also major disappointment and heartache. Nilsson had two sons, one would go on to win a World Enduro championship and the other would be killed in a Motocross accident. If Motocross was fought inside the four corners of a boxing ring you can bet Bill Nilsson would still be punching away when the bell rang for the final round, in fact the first ever World Motocross champion didn’t need a boxing ring to vent his anger. Nilsson was one of the toughest, roughest rider in the World back in the 1950′s, but then again most of the AJS, and BSA riders in that era rode on sheer heart, fighting their machines into corners, and never accepting defeat. “I was young when I first came into Motorcycle racing, I think it was 1950 and I was 18-years-old, I was interested, and I had a talent, I was very young when I began, just doing Speedway, then I didn’t get a ride in Speedway, so I tried Motocross. 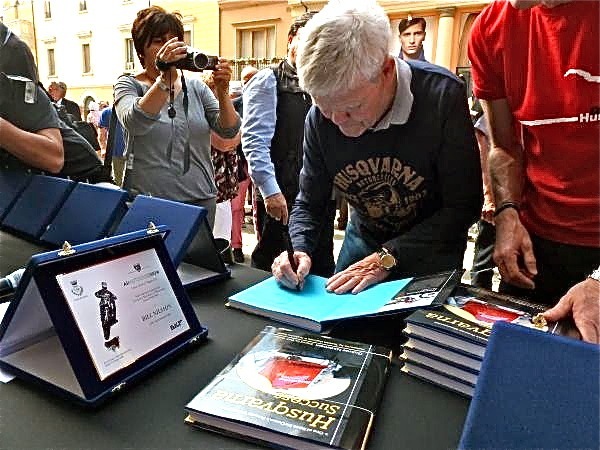 “After two years I was in the National Motocross team, I rode the Motocross des Nations in 1952, and then I got a factory ride with AMC in London, then I rode BSA, Husqvarna, I a lot of bikes, I was also a World champion on AJS in 1957, I was 25-years-old then. “Back then you didn’t start riding until you were 18-years-old. I was a professional at a very early age for that time. I rode with guy’s like Sten Lundin, Rene Baeten, Leslie Archer, Jeff Smith, those guys were tough, factory riders for BSA, and I was many years on BSA. 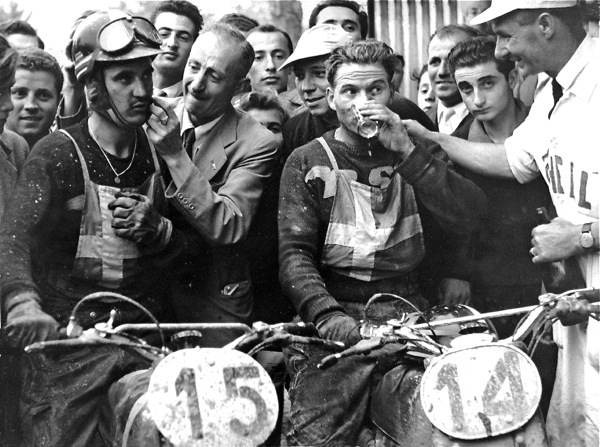 “I got sacked by BSA because I was too dirty, I wasn’t the cleanest rider. They sacked me, and they thought they could cut my wings, but then I went to AJS and won the World championship. Nilsson caused his share of accidents, rode hard into his rivals, and never gave an inch on the track. He knew he was feared and his rivals knew not to mess with the dangerous Swede. He was also lucky enough to have crowd support, and we are not talking about a few friends. “I liked to ride hard, push the other riders around, You know because of my Speedway background I like to slide the bike, and that helped a lot. I was known for riding dirty. If I had a long start I was good, it was like Speedway, it was easy for me to get to the first corner and slide the bike into the corner. “I could race on any track, sand is very heavy, but I could fly on it. I like to warm the competition up, make some dirty moves, get my competition fired up. Back in my day you could go to a Motocross race in my village, on a day when it was raining and we would get around 10.000 people watching. Nilsson didn’t have everything his own way though when it came to dirty riding, he also found the Belgian riders and fans could mess with your head it you dare challenge them. Back in the summer of 1958 Nilsson came across a very determined Rene Baeten. The two were fighting for the World 500cc Motocross championship around the Namur circuit in Belgium. To this day Nilsson feels the crowd gave the championship to Nilsson, of course we don’t have Baeten’s side of the story, although Nilsson’s version is entertaining enough. “I think the best moment in my career was spent over a long period, it wasn’t one moment, it was so many. I hated losing, we had so many big battled in Belgium. I lost a World championship at Namur, it’s a funny story. “I was racing against Sten Lundin and Rene Baeten. I was 35 second behind the leader after the first lap, I had crashed and was a long way back. With three laps to go I caught him, I tried everything, I tried to over jump him, I tried everything, but I couldn’t get him. “Then on the last lap I decided to crash into him, take him from the track. We went down a steep hill and I pushed my bike up against his and crashed him out, I had a lot of experience you know. Nilsson is proud of the fact he remained in contention for so many World 500cc championships, winning a magnificent 15 Grands Prix, which places him 13th in the all time 500cc GP winners list. Nilsson still works hard, plays hard and enjoys being around Motorcycles. Some 50 years after he began in the sport. Nilsson retired from racing at the age of 35 and began to help the younger Swedish riders. 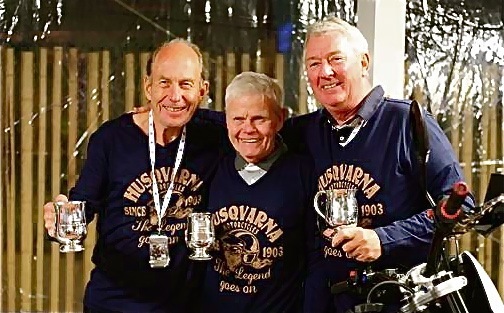 Having worked on and off with Husqvarna in his career saw the 1957 and 1960 World champion pass on his experience to two other legends of the sport. “I had a lot of contact with Bengt Aberg and Torsten Hallman, I was at Husqvarna from time to time. I would help Aberg sometimes, I was like a mentor, sometimes I would help Hallman with frame building and suspension. I never got the chance to work really good with Husqvarna. “I was tough to work with, I was very demanding.” Despite being one of the legends of the sport Nilsson does not attend Motocross events anymore, whether it be from the sadness of losing a son to the sport, or lack of time nobody will ever know. Ten years after losing one of his sons to the sport he loved his other son Jeff Nilsson took the 1991 World 125cc Enduro championship after a season long battle with England’s Paul Edmondson. The young Nilsson (who also raced Supercross in Australia in the 1980′s) showed all the courage of his father as he took up the challenge of Edmondson, and doubled his championship tally in 1992, again leading home Edmondson. Despite his huge success in Motocross and the fact his children raced the former World champion does not get time to attend Motocross races anymore, although he does get involved in competitive Motorcycle racing. If ever you get the chance to travel to Sweden, make sure you check into the Husqvarna museum, a place where the machines of Nilsson can be displayed in the environment they so belong.